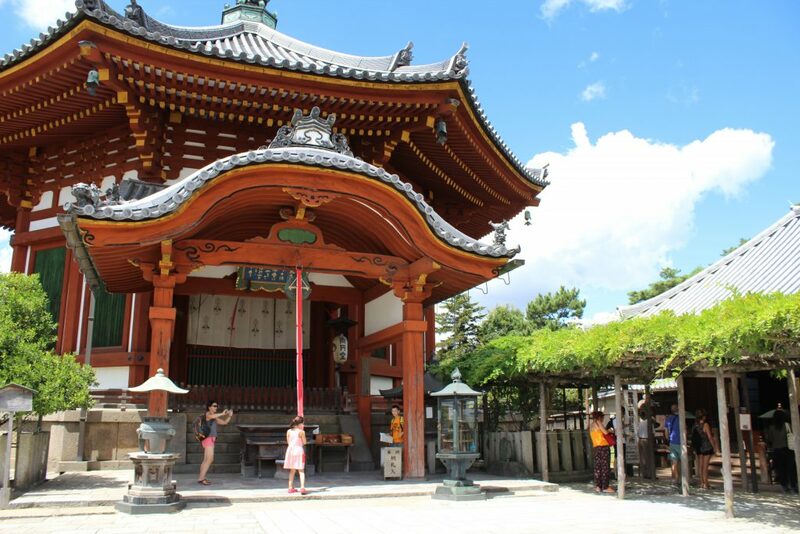 Nara is just a bit more than one hour away from Kyoto and totally deserves a visit. In case you are short on time, everything I did can be done in pretty much half a day. You can get here my shared Google maps with what to do/see in Nara – the map has the precise location of all great places we visited in Kyoto and Nara. 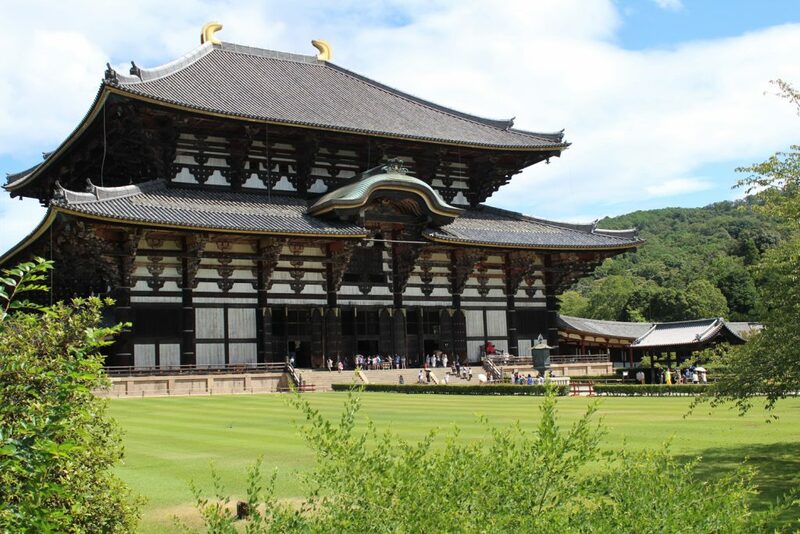 Shall we start a tour through Nara? As I said above, we’re originally staying in Kyoto and then decided to take a day trip to Nara. To start we did a short walk to Kofukuji to see the second tallest pagoda in Japan. There is no photo because it was under restoration! Bummer, can you believe that? This charming park is right in front of another temple we wanted to visit (see below) and is full of deers! Aw, they are so cute, you can even pet them! If you’re keen to make the deers happy, there are stands selling a special biscuit to feed them. Curiosly enough, I’ve also seen many tourists trapped in a circle of hungry deers. This is one of the most outstanding temples I’ve visited there. You can’t really see how big this place is from the photo below (downsides of a two-dimensional media), it’s unbelievable. Inside of it you will find a huge Buddha statue that is impressive from every single angle. 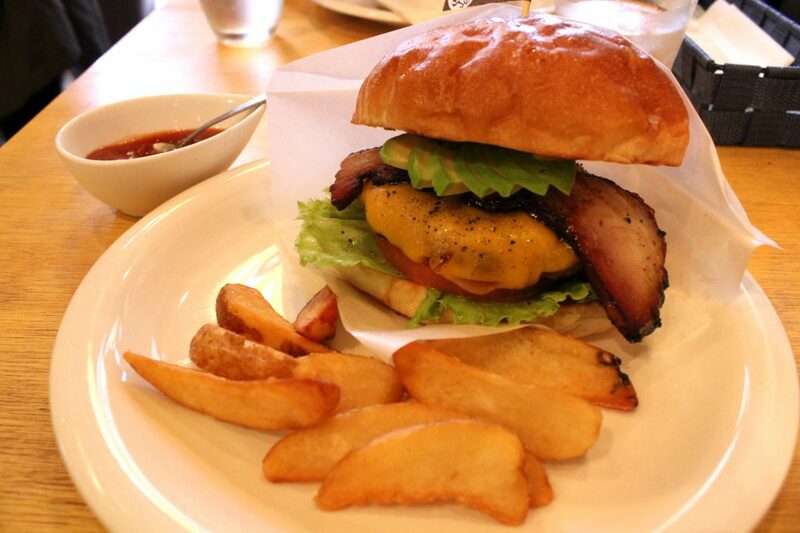 In case you want a break from the Japanese cuisine, this place makes delicious burgers. By the way, American style burgers! If that wasn’t exciting enough, they also make their own bacon!!! We had a beef burger, with homemade bacon, avocado, cheese, salad, and chips. 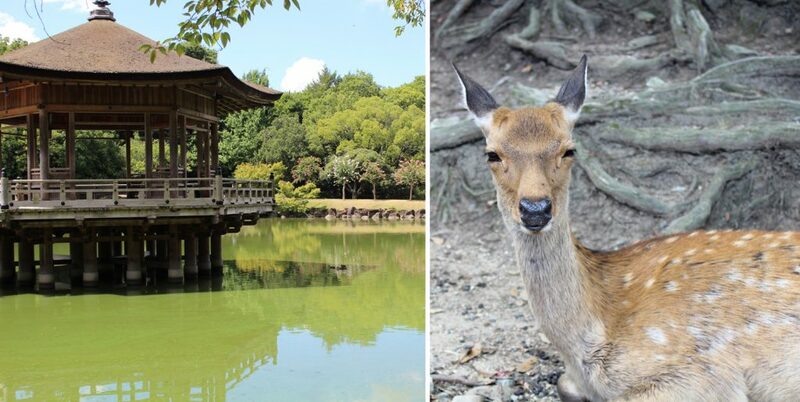 They are located a stone’s throw away from the train station, so you can stop there either on your way back or to Nara Park. Beef burger, with homemade bacon, avocado, cheese, salad, and chips. 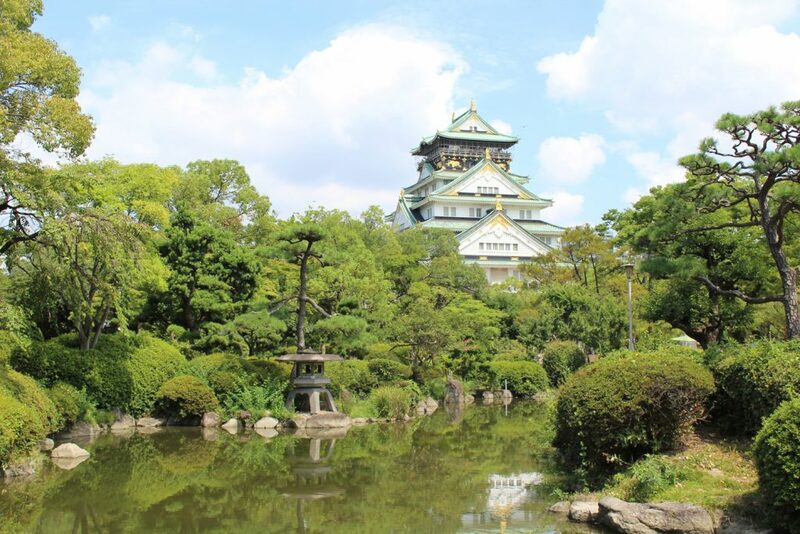 There are so many things to do in Japan, we simply loved the country and their culture. While in Kyoto, in case you have time, I can totally recommend you a day trip to Osaka. It is just a bit more than one hour by bullet train (Shinkansen), and you can use your JR pass to pay for the trip. 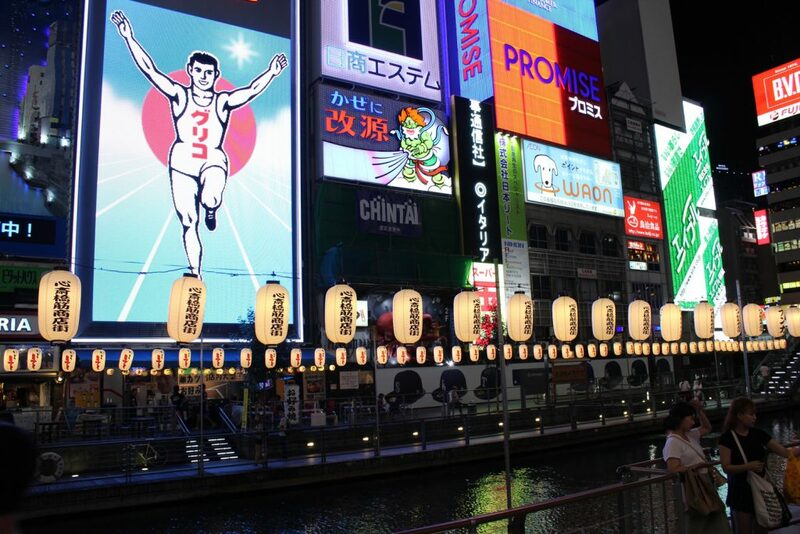 Osaka is a large city with plenty of activities and sightseeing, you can easily spend a day (or more) there. It’s known for its modern architecture, nightlife and hearty street food. 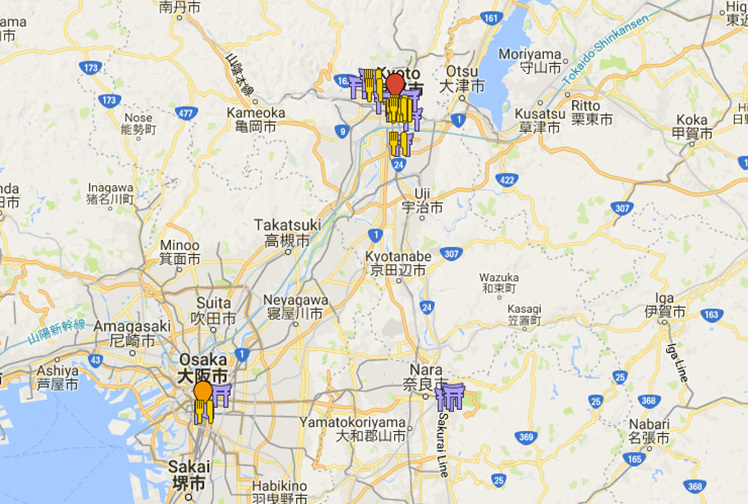 You can get here my shared Google maps with the precise location of the great places we visited in Osaka (and Kyoto as well). Now, let me tell you a bit of what we did in 1 Day in Osaka. Our first stop was at the Osaka Castle. The castle itself is amazing, and all the park around is also great, nicely maintained. 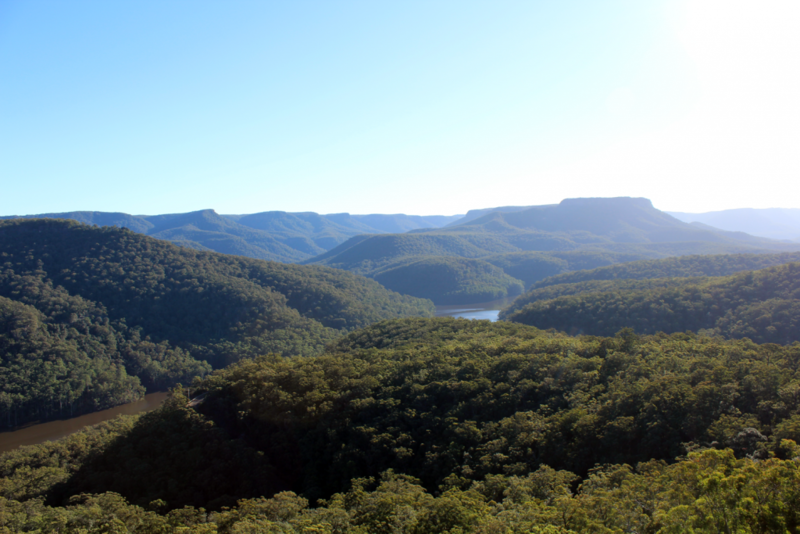 You can also pay to enter the museum inside the castle and go all the way to the top to have great views from the city. Namba is a very busy suburb to explore while in Osaka. We decided to spend our afternoon walking around that area, especially along the famous Dotonboru Street. A good thing is to do is to wait until dark to see all the neons litting up. 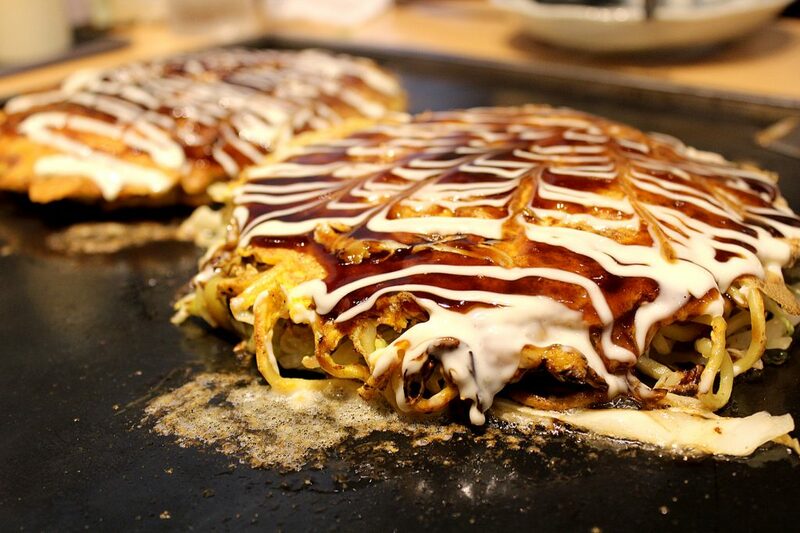 A good place to have an authentic Okonomiyaki in Osaka. There are many different flavours, including sets for 2 people with very competitive prices. We ordered one of these sets, which included two pancakes, Japanese omelet and salad. Yummy! 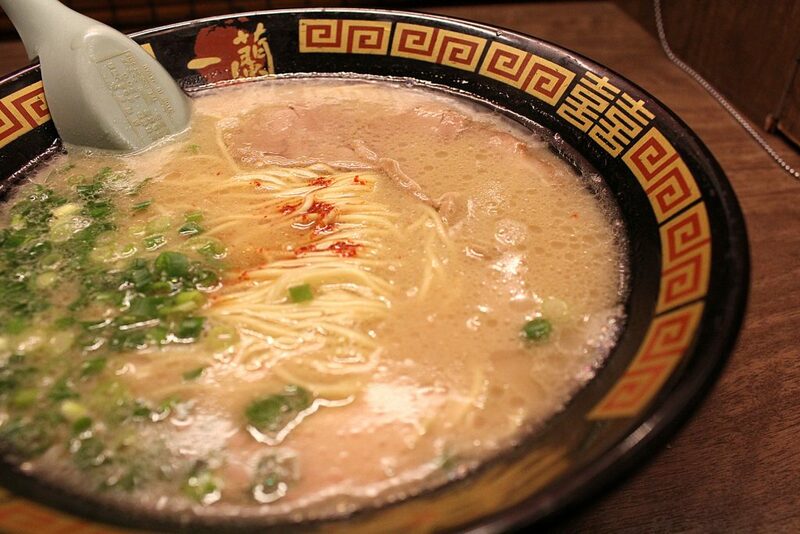 This is a curious ramen house. You order from a vending machine, then one of the waiters takes you to a booth (that’s right, so cool), and your food is served from a small window in front of you. 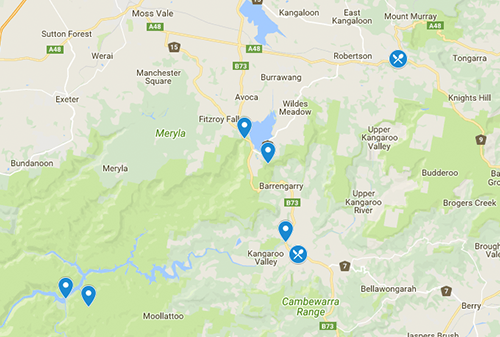 Check here photos from my experience there. Ah, of course, needless to say their ramen deserves more than a single visit to be fully appreciated. You’ve probably seen my favourite restaurants in Tokyo (if you haven’t, please do it before you go to that amazing city). 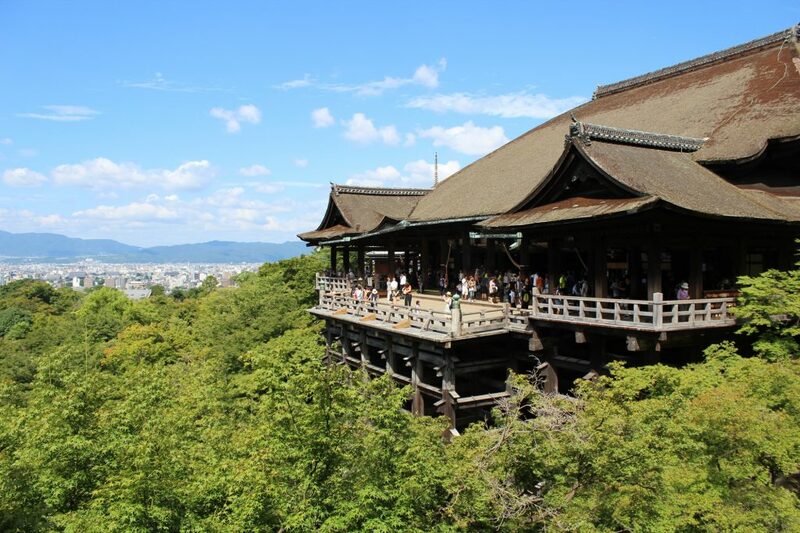 Now it’s time to tell you which ones I’m still dreaming about in Kyoto! You can ready my extended review for each one of them just by clicking their titles. Let’s start? 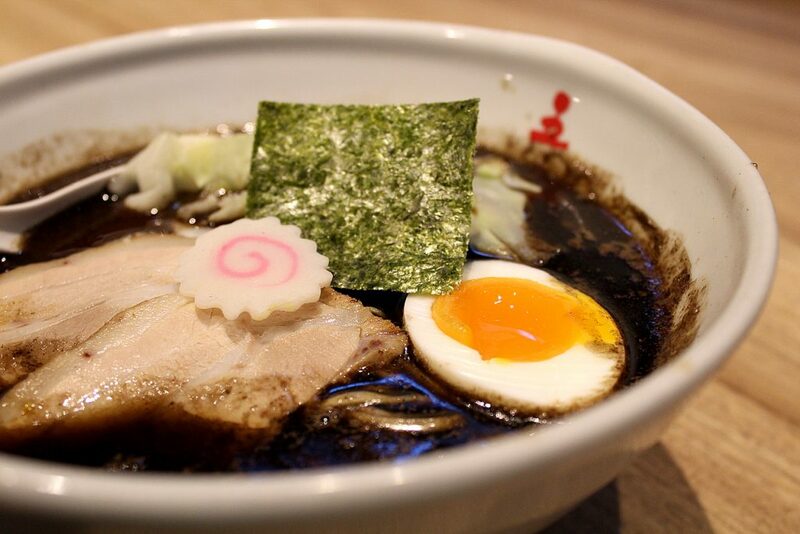 This place makes Burnt Soy Sauce Ramen and other different flavours that are not usually found in the super traditional city of Kyoto. 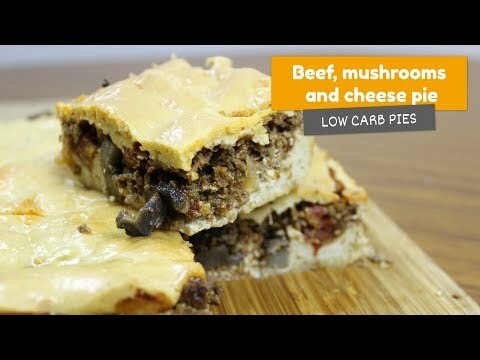 Delicious and a must try. Super cool ramen experience where you are served in an individual booth. 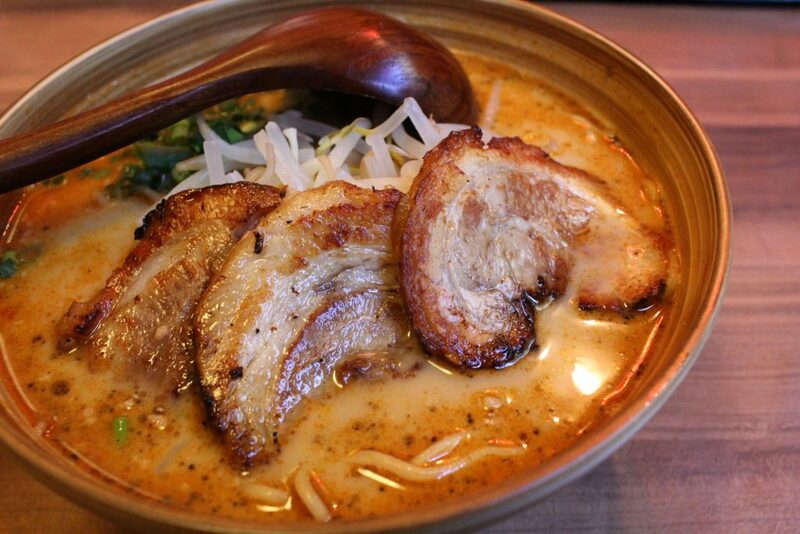 But I’m not saying it is worth a visit only because of the experience though, their ramen is indeed yum and totally worth a try. 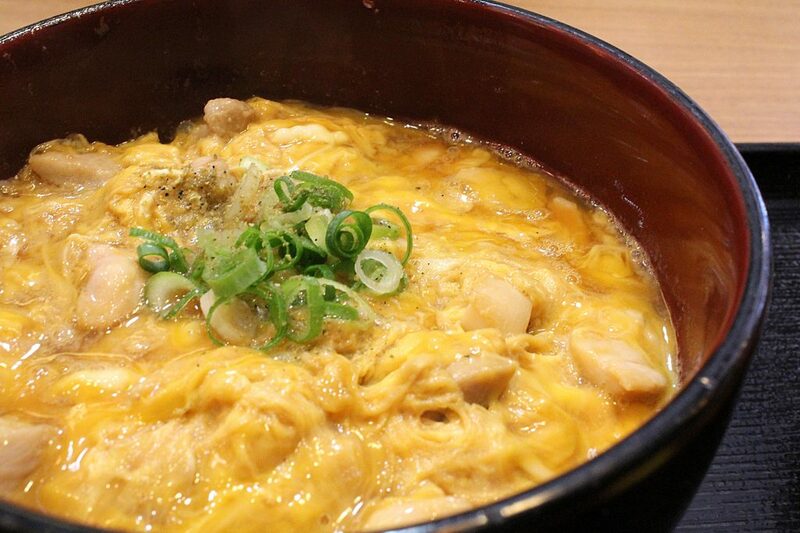 This family-owned restaurant makes perfect homemade udon noodles and also offers many delicious rice bowl options. 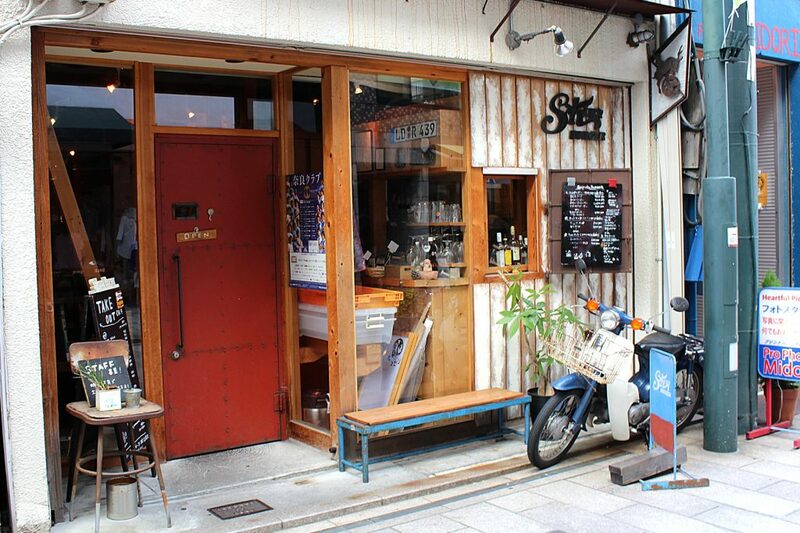 This is not truly a restaurant, but I strongly recommend you to visit this little cafe. 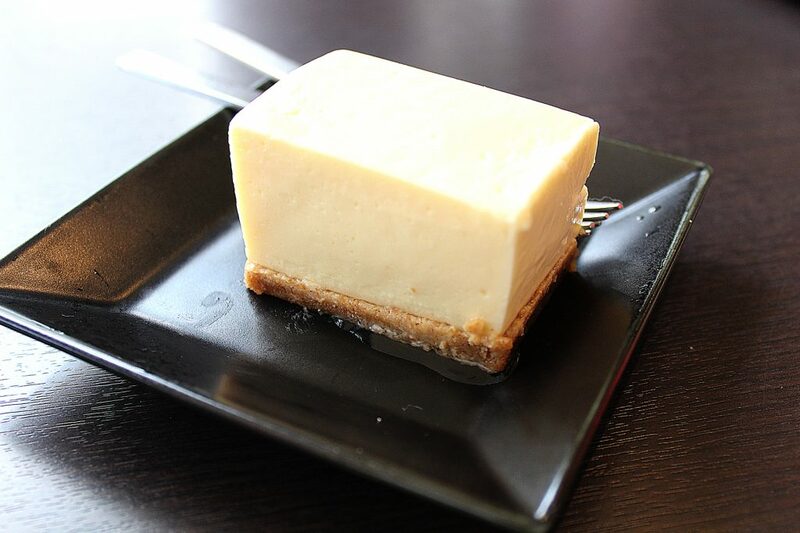 They serve many dairy free desserts made of soy milk. Please, try their cheesecake for me (bonus points if you try it multiple times).